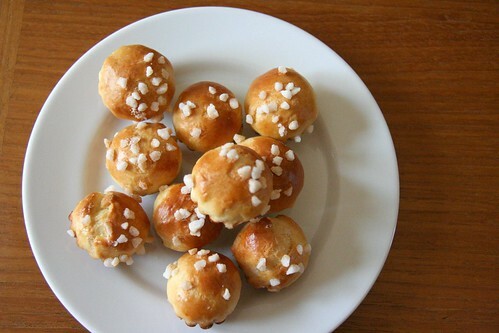 Ah, brioche. I had so much fun trying out a few recipes and sampling the results. For the recipes I forced myself to actually look through some of our cookbooks. My habit is to jump online and search for recipes while our nice collection of cookbooks collects dust. Do you do that too? 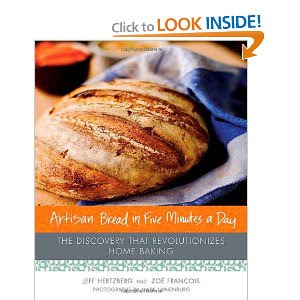 Anyhoo, the first recipe I tried was from What you Knead by Mary Ann Esposito. 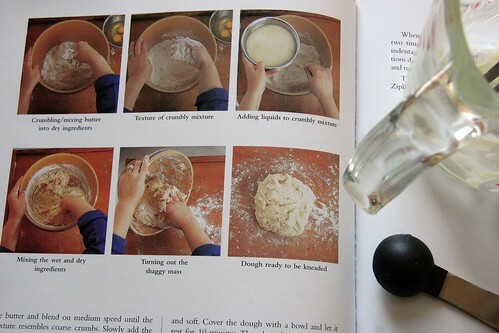 This is a lovely cookbook with photographs of each step of the bread making process. This is so helpful. Curious about forming a fontana to make your bread dough? She has a photograph of each step. To a bread making novice (me!) this is invaluable. Esposito's recipe made a gorgeous, shiny elastic ball of dough. The ingredients she calls for are very specific - bottled water, King Arthur unbleached all-purpose flour, and NO rapid rise yeast. Needless to say I had to use what I could find. Although the end result was very tasty I was curious to try a another recipe. For my next foray into brioche I followed a recipe in Artisan Bread in Five Minutes a Day by Jeff Hertzberg and Zoe Francois. This is more than a book of recipes but instead a method of making bread. Essentially what you do is make enough dough at one time for 4 loaves of bread. You freeze or refrigerate the extras until you are ready to use them. The method used in this book is the complete opposite of Esposito's specific, detailed procedures. In the Artisan Bread method there is no kneading or no need to proof the yeast. In fact, they don't even care what kind of yeast you use. 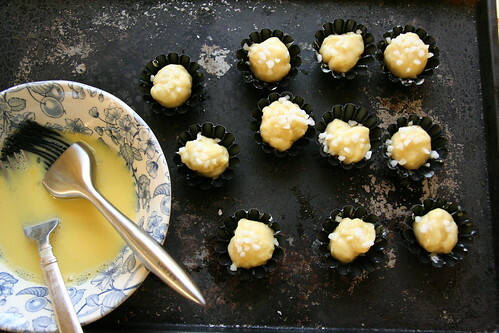 The ingredients are chucked into a bowl. As a chucker myself I really like this. But you know what I liked even more? The ease of producing a loaf of fresh, delicious brioche without any mess or hassle - thanks to the balls of dough patiently waiting in the freezer. This method does take more than 5 minutes a day - thaw overnight in fridge, rest for an hour before baking, and then baking time. But still, it is so easy and the bread was delicious. The truth is I think both recipes are great for different reasons. Esposito's gives you one well loved, pampered and produced loaf of bread. Hertzberg and Francois give you ease and flexibility. Both recipes give you a delicious loaf of brioche. Have you baked with either of these books? Whaddya think? I have the second book, but haven't baked anything out of it yet. Your post has inspired me, though! I want to go bake some bread! a trip and a move. I am impressed. Oh yummy, these look wonderful!!! My husband has the Artisan Bread book, and the man is in love. He continues to bake the same type over and over and over and loves to share it with friends and neighbors. He even bought this huge plastic dough keeper (?) that takes up an entire shelf in our Euro fridge. The Italians neighbor with roots in Sicily LOVES the bread, tastes like home. I hope he'll try the brioche next.